Everyone is annoyed at the state of things in America as the government shutdown drags into its second week, whether you're one of 800,000 furloughed federal workers or just a D.C. tourist who wants to go to the goddamn Smithsonian. Now a group of truckers will take matters in their own hands with a plan that combines both traffic jams and vigilante justice. 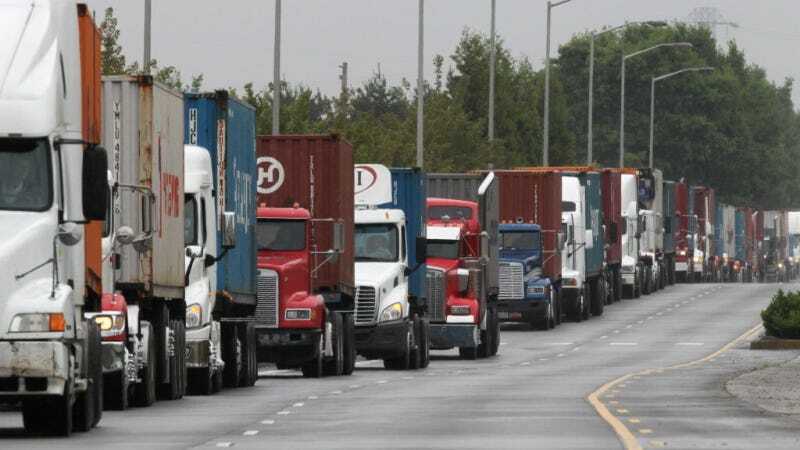 Enter Truckers Ride for the Constitution, a right-leaning group of 18-wheeler drivers who plan to use their trucks to block up the D.C. Beltway "three lanes deep" on Friday before they move into the District and personally arrest the members of Congress. According to U.S. News & World Report, the only people who are safe from the truckers' blockade of our nation's capitol will be drivers of emergency vehicles; anyone who doesn't have "T2SDA" — an acronym for the event's original name, "Truckers to Shut Down America" – written on their vehicle will not be allowed to pass. Last week more than 3,000 truckers said they were coming, and this week organizers say they have lost count of how many will show up. They have a litany of grievances they wish to present, including complaints about their wages, gas prices, the Obama administration’s regulations of their industry, the NSA's domestic spying programs, and the national debt. "We are not going to ask for impeachment," Conlon said. "We are coming whether they like it or not. We're not asking for impeachment, we're asking for the arrest of everyone in government who has violated their oath of office." Um, yeah. I'm... highly skeptical of this event for many, many reasons. First of all, their plan won't work because there is no way to make the Beltway any worse than it already is. Second, even though the Capitol Police aren't getting paid at the moment, I doubt they'll take this lying down, as they've been a bit on edge lately as it is. Third, this really stinks because even if they don't manage to arrest Congress (spoiler alert: they won't) but are successful in their traffic jam, that will just affect thousands of ordinary folks in the Virginia and Maryland suburbs around the city who are just trying to get to work. I think it's safe to say most members of Congress live in the District itself; this event won't screw up their mornings. Of course, now the group seems to be distancing themselves from Conlon, and they stress that this will instead be a "peaceful protest" rather than the trucker insurrection he made it out to be. It remains to be seen just how much their "protest" will jam up traffic, anyway — a similar trucker protest in 2007 did not destroy people's commutes, according to a Washington Examiner report. I, for one, welcome our new trucker overlords.